We present in this document the TSN Ontology ( Territorial Statistical Nomenclature Ontology ) to describe any Territorial Statistical Nomenclature i.e., partitions of space into territorial units (e.g. administrative, electoral, statistical units) used as a suppport to the collect of socio-economic statistics. This work was supported by the French region Auvergne-Rhône-Alpes [grant number REGION 2015-DRH-0367]. ARC7 : Innovations, mobilités, territoires et dynamiques urbaines. This ontology allows describing any Territorial Statistical Nomenclature (TSN) i.e., partition of the territory (electoral, administrative, statistical, etc.) used as a support to the collection and restitution of statistical data (e.g., describing a territory in terms of population, unemployement rate, transport access, etc.). The LevelVersion concept describes a unique representation of a Level, stable for a period of time. This period of time is inherited from the reference period of the NomenclatureVersion the LevelVersion belongs to. The Nomenclature concept describes an abstract representation of the subdivisions of a territory into Levels and Territorial Units (i.e. also called 'Structure'). A Nomenclature can be seen as a hierarchy of sets of Units with at least one Level. It is designed to answer administrative, electoral and especially statistical needs. The NomenclatureVersion concept describes a unique representation of a Nomenclature, stable for a period of time. Stability ensures that statistical data refer to the same territorial units for a certain period of time (source http://ec.europa.eu/eurostat/web/nuts/history) (i.e., the reference period of the NomenclatureVersion). The Territory concept describes an abstract representation of a portion of geographic space that is claimed or occupied by a person or group of persons or by an institution (source http://www.oxfordbibliographies.com/view/document/obo-9780199874002/obo-9780199874002-0076.xml). For instance, the European Union is a territory, the Grenoble metropole is a territory, etc. The TerritoryVersion concept describes a unique representation of a Territory at a specified period of time. As the boundaries of a territory may vary (e.g., fusion with another territory), it results succesives versions of it. A territory may have as many versions as it underwent modifications. For instance, the European Union of 27 and the European Union of 28 member states are two versions of the European Union territory. 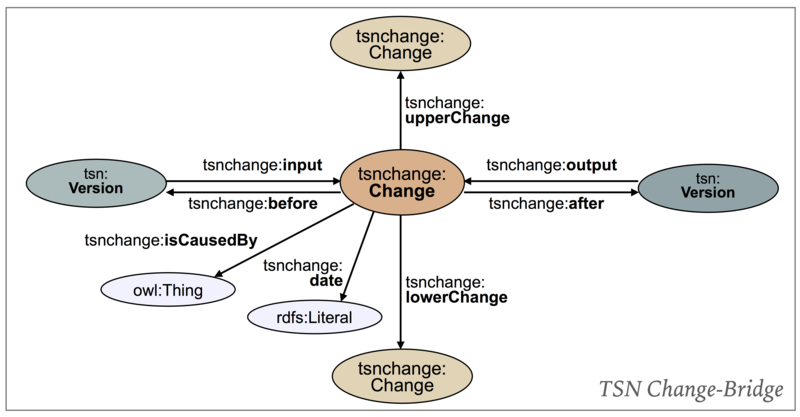 The TSNComponent concept is the super class of any concepts of the TSN ontology. The Unit concept describes a piece of geographic space that belongs to one Level of a Nomenclature, and may in turn contain sub-units (or not, if the unit belongs to the lowest level of the nomenclature). Statistical observation are made on Unit. The UnitVersion concept describes a unique representation of a Unit, stable for a period of time. This period of time is inherited from the reference period of the NomenclatureVersion the UnitVersion belongs to. The Version concept describes one Version of a TSNComponent, valid for a period of time. A Version resource hold all the attributs of a TSNComponent that may vary, i.e., all attributs except those that hold the identity of the resource (i.e. Identifier of the TSNComponent). The Version concept is closed to the TimeSlice concept of ontologies of fluent. Deprecated Property, <http://purl.org/net/tsn#isMemberOf> property is now preferred. Indicates the LevelVersion the described UnitVersion resource belongs to. Indicates a TerritoryVersion covered by a NomenclatureVersion i.e., the TerritoryVersion is the spatial applicability of the NomenclatureVersion. Indicates an Acronym of a TSNComponent (e.g., EU27 is the prefered acronym used to designate the European Union made of 27 members). Indicates a Description of a TSNComponent. It may include but is not limited to: an abstract, a table of contents, a graphical representation, or a free-text account of the TSNComponent. Indicates a division (LevelVersion) in the NomenclatureVersion hierarchy. Indicates an unambiguous reference to a TSNComponent, throughout the TSN versions. This attribut holds the identity of the TSNComponent i.e., if this identifier changes then the TSNComponent ceases to exist. Indicates a UnitVersion that belongs to the described LevelVersion. Indicates the Name of a TSNComponent. Indicates the TSNFeature that is immediately below the described TSNFeature. Indicates the TSNFeature that is immediately above the described TSNFeature. Indicates a resource is a Version, edition, or adaptation of the described resource. Indicates a NomenclatureVersion that covers a TerritoryVersion i.e., the TerritoryVersion is the spatial applicability of the NomenclatureVersion. 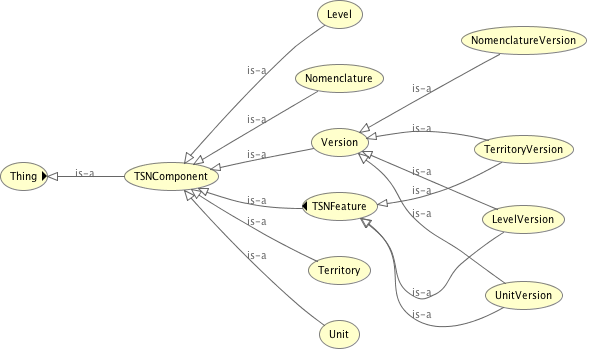 Indicates the NomenclatureVersion which a LevelVersion resource divides. Indicates the LevelVersion the described UnitVersion resource belongs to. Indicates a TSNComponent of which the described resource is a version, edition, or adaptation. This resource has a more specific, versioned resource. This property is intended for relating a non-versioned or abstract resource to several versioned resources, e.g. snapshots. For instance, if there are two snapshots of the News page, made on 23rd and 24th of December, then: <http://news.example.com/> pav:hasVersion <http://news.example.com/2013-12-23/> ; pav:hasVersion <http://news.example.com/2013-12-24/> . If one of the versions has somewhat the equivalent content to this resource (e.g. can be used as a permalink for this resource), then it should instead be indicated with the subproperty pav:hasCurrentVersion: <http://news.example.com/> pav:hasCurrentVersion <http://news.example.com/2013-12-25 > . To order the versions, use pav:previousVersion: <http://news.example.com/2013-12-25/> pav:previousVersion <http://news.example.com 2013-12-24/> . <http://news.example.com/2013-12-24/> pav:previousVersion <http://news.example.com/2013-12-23/> . Note that it might be confusing to also indicate pav:previousVersion from a resource that has pav:hasVersion relations, as such a resource is intended to be a long-living 'unversioned' resource. The PAV ontology does however not formally restrict this, to cater for more complex scenarios with multiple abstraction levels. pav:hasVersion is a subproperty of dcterms:hasVersion to more strongly define this hierarchical pattern. It is therefore also a subproperty of pav:generalizationOf (inverse of prov:specializationOf). To indicate the existence of other, non-hierarchical kind of editions and adaptations of this resource that are not versioned snapshots (e.g. Powerpoint slides has a video recording version), use instead dcterms:hasVersion or prov:alternateOf. Indicates the period of time (i.e., Interval defined with two point in time <https://www.w3.org/2006/time#hasBeginning> and <https://www.w3.org/2006/time#hasEnd>) to which a Version resource is stable and considered as the official one. This document has been generated by Parrot, a tool created by Fundación CTIC. Source code is available.